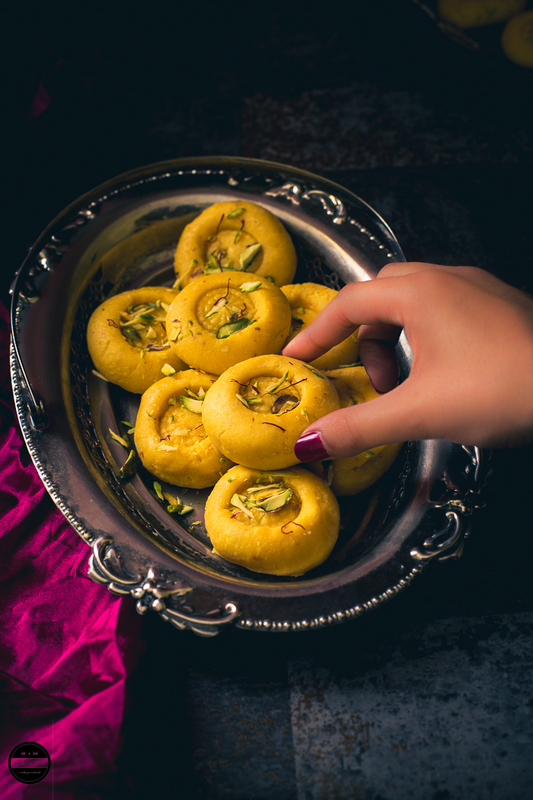 If you are a Jabra (great) fan of Indian Sweets, you are reading the right post! 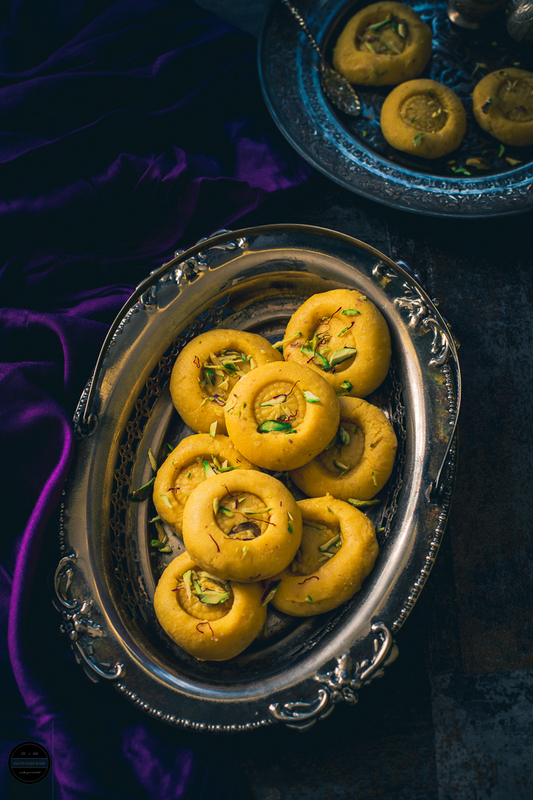 Kesar Malai Peda or Milky Saffron Fudge, is one of the most popular rich Indian confectionaries. Prepare these and bring them to any festive occasion or celebrations and see how your festivity becomes even more joyous and delightful. These are simply divine and scrumptious, I bet these have to be everyone's favourite! 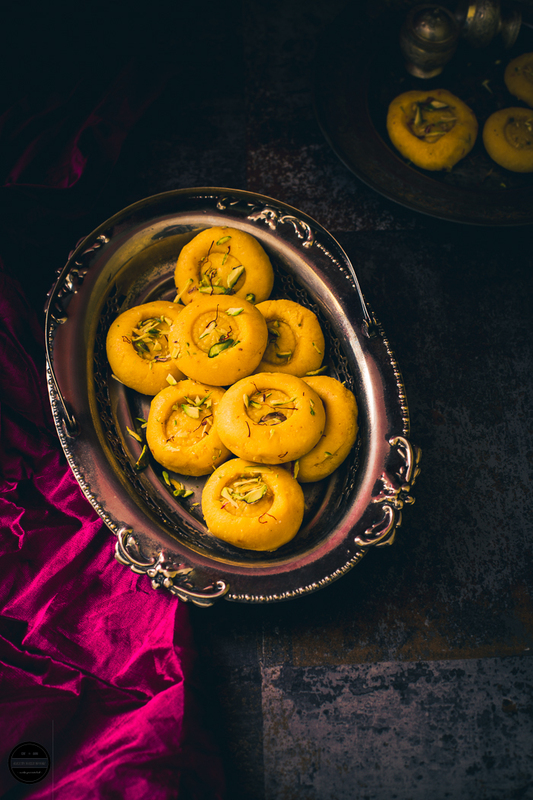 These magnificent looking Kesar Malai Peda are ideal for Prasad. Ideal for fasting as these are made without cornflour. India is a land of many festivals, celebrations, and traditions, almost every day is a celebration day. And from today every Hindu across the globe will be celebrating a very popular festival 'Navratri' (Nine Nights), it is the longest festival in the world. A festival in which the celebrations involve devotion and fervour. This festival is dedicated to Goddess Durga and celebrations lasts for nine days. Throughout the world, Indians celebrate this festival with their own traditions and beliefs but in nowhere performed with more panache and zeal than in the Indian state of Gujarat. The people of Gujarat are known as Gujarati. The Western state of Gujarat is the only state that erupts into nine-night dance festival aka Dandiya Raas or Garba. There is one thing about any Gujarati, No matter whenever they travel in the world or settle in any corner of this globe they take a piece of Gujarat with them and as the Navratri festival approaches, revellers away from their home country always manage to find ways of celebrating. And I am no different to them. Every Navratri season me and my daughter can't wait to deck up in traditional dresses called 'Chaniya Choli' and pick a dandiya for a great night. This year is not going to be the same, as my father passed away a few months back in India, so we are not going to celebrate major festivals for next 12 months, but will perform small pooja at home instead. Indian pooja and ceremonies are always incomplete without Prasad ( sweet food offered to god). Recently we performed a couple of religious ceremonies and my daughter made these kesar malai peda all on her own from scratch - all the way from making homemade paneer to shaping the peda. So glad she is learning to make Indian sweets too. It oozed with saffron flavours, perfect for a dessert after an Indian meal. Wishing all readers a wonderful and joyous Navratri! You can buy readymade Paneer if you like. Kesar Malai Peda, hugely popular amongst Indians, so rich and scrumptious. 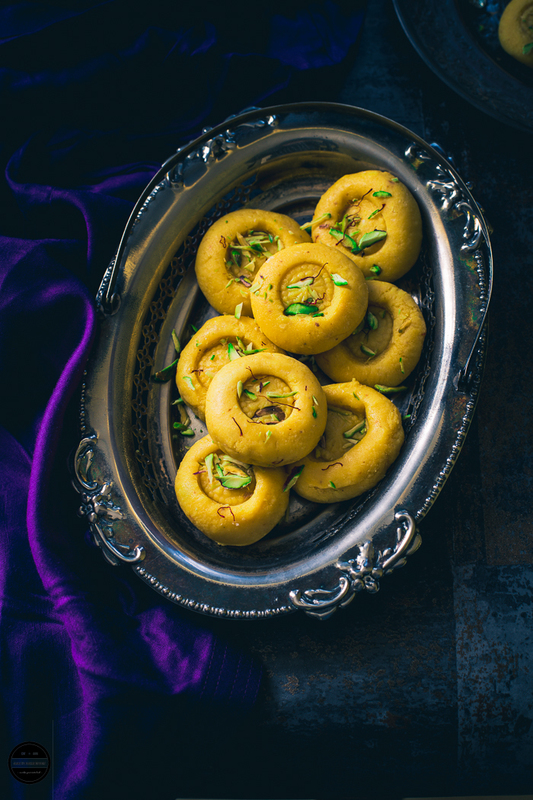 It is prepared with Paneer, Khoya, sugar, and flavoured with aromatic spices such as saffron, cardamom and garnished with slivers of pistachio and saffron threads. Place milk in a heavy bottom pan and bring it to boil. Meanwhile, soak saffron threads in cream and leave it aside.Add yogurt, lemon juice or vinegar and let it curdle.Keep milk on heat and stir the milk gently, this helps milk to curdle. If some reason does not curdle, add little more lemon juice or yogurt.This should take few minutes When the curds have separated and the whey turns a pale green. Remove from the heat, and leave it for 5 minutes.Now line a large sieve with muslin or cheese cloth over a large bowl or pan. Strain paneer cheese into sieve and run some cold water through it.Leave the whey for other use. ( see note )Wrap the cheesecloth and wring gently and drain the water completely. In a thick base kadai or pan add drained paneer and grated khoya.Keep the heat low and combine well.Add saffron cream and keep mixing about 10-12 minutes.Now add sugar, keep stirring continuously until the mixture thickens.It will take another 25-30 minutes easily.Add cardamom and nutmeg powder, mix well.Transfer the mixture to another plate and let it cool.Divide the cooled mixture into equal portions and shape them into round pedas.Garnish it with slivered pistachios and saffron threads.Offer as prasad, give it as a gift or enjoy after an Indian meal. Pedas looks super yummy. Perfect for Prasad. Love the styling and the cookies look yummy. Beautiful shot! I love the first picture, it is gorgeous. And the malai peda is so tempting Jagruti. Love coming back to your blog. Beautifully captured as always. That platter can up the festive fervor of any celebrations. Visual stunner I think these are totally melt in the mouth. Yummy. These pedas look super delicious.Lovely capture Jagruti. Perfectly made pedas.. I had made them when I was in Brazil. I don't make sweets often there is no one to eat them. 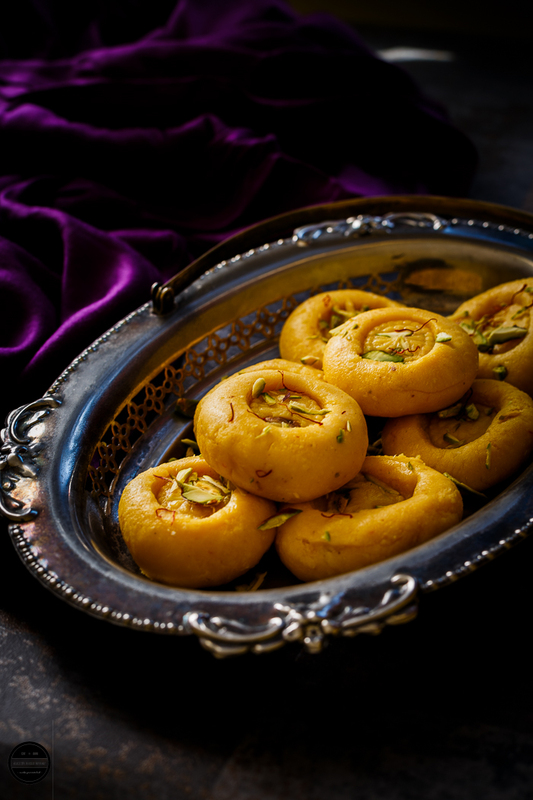 I have only ever made peda from milk powder, this recipe with paneer is interesting and I am going to make it for sure.Your daughter has made these beautifully. These look lovely and like they would melt in your mouth! !